As usual, what I plan for the next Pyro Newsletter and what I actually, eventually write about can end up being worlds apart. A lot happens in my pyrographic life that can change my focus for the newsletter from one breath to the next. I usually have a clear idea of what I'm going to write about well in advance but that structure will often change because of what's happening around me, both artistically and personally. This past week I received the sad news that pyrographer, Jan Farrar, had died and I would like to amend this issue at the last minute to say some words about her. Other unexpected problems also had me chopping and changing the format for this issue. Unfortunately my scanner has chucked a massive wobbly and I can't scan the two pocket knives I wanted to talk about in regards to miniature wood burning on functional objects. So instead I'm going to bung in a preview about dark wood burning. This is something I will be discussing in more detail the next time around when we have a step by step look at burning texture in dark woods. Hopefully my scanner problem can be resolved soon and we can also have a good look at the knives in the next issue. This issue will also look at the release of my new pyrography pattern book and CD, the first in a series I'm working on that are to be theme based and directed at the burner. Apart from a few announcements, we'll round this issue off with me asking you, the burner, for your help in tackling one of the most annoying problems that pyrographers face, fading. As per usual, I hope you get much out of The Pyro News. P.S DON'T FORGET TO UPDATE YOUR BOOKMARKS! Sue Walters Pyrography has moved to it's own domain. How odd the friendships we make over the Internet are. I mean, I have met literally hundreds of people by distance, connected only through a few wires and an interest in an obscure art form. Just about every single one of them has written kindly to me and I return that kindness when writing back. We share ideas and thoughts and passions and sometimes we even share parts of our lives with each other. Some of these people I get to know better than others, and some of them become my friends...all via two computer screens and some tapping of keys. What a funny world it now is that you can make friends with a person this way and be profoundly saddened when they die and yet you have never heard their voice or know how tall they are...or what colour their eyes are. I didn't know any of these things about Jan Farrar but she was a friend to me as well as to many other pyrographers, animals lovers and people around the world. I answer all my Email eventually, so I know I wrote back, then she forward, me back and so on. Initially it was about pyrography, then about her Mum and my Mum, then about our dogs, then about health scares, then....it just kept going...as it does on the Email. 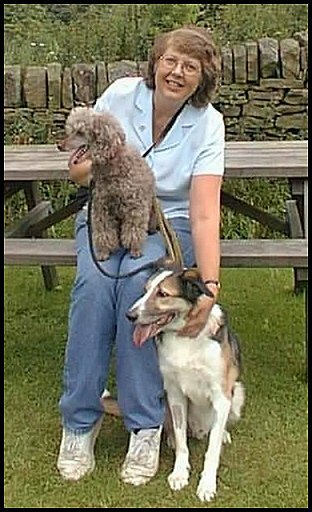 I remember how kind she was when my mate Dorji died and that she understood how it can hurt to lose your best doggie friend. She sent me the rainbow bridge thingee, which I had never seen before and of course it made me blubber like a baby, but in a good way. I remember how she always asked after my Mum and how she understood the stresses of that situation because she had been going through it herself. I remember how kind she was about my work and how modest she was about her own. From the moment Jan began to burn she tried to be better...impatiently at times. I wonder if she understood how far she had come in such a short time? The people at the pyro groups sure told her, so I hope she believed us. The people who proudly hang her work on their walls must also know how lucky they are to have a Jan Farrar original. I remember how keen she was in the discussion groups; how polite; how helpful. LOL...how she put us in a frenzy when she asked us how to burn white! I didn't need to know the colour of Jan's eyes to know she was kind and even and gentle and helpful and compassionate...a great burner and a dear friend. What's more, I'm not alone in knowing this or alone in being saddened that I won't see her words or art again. The Internet is a funny place to make friends, but we do and we are...and we are better off for it. One of the questions I get asked a lot about is how to burn on dark wood. Well...it's a bit of a tricky one. You can of course burn on dark wood without adding any colour or highlight at all, but because of the darkness of the canvas being used, there is a certain natural loss of contrast between wood and art work. Black against dark just doesn't allow for a lot of subtle burning to show through. If you want to burn on dark wood and not add colour you are often forced to either burn simple line work or highly contrasted work. Some wood is indeed too dark to even take the most basic burning and it's not worth the effort, especially after the timber further darkens after finishing. One way however, to make this wood suitable to burn, is to apply some sort of pigment to help the work stand out. Ding, ding: round 12 in the never ending debate of should we, or should we not add colour to pyrography. In the black corner we have people who believe that colour should never be used in pyrography. In the Red corner we have people who love using colour in pyrography. In the middle, wearing a white shirt, are the likes of me, who think that colour has a place in the right situation. I love black and white photography, black and white art and black and white films. I prefer most photo portraits in black and white, but would the famous National Geographic cover of the Afgahn woman have been so striking and effective if you couldn't see the green of her eyes? Would autumn trees or a sun set look quite as good? To myself, the use of colour or not is often decided by what I am trying to convey. A horse for instance, to me, is noble and strong and it's structure and air are what I'm looking at...colour doesn't feel important in that case. The same with an elephant, a musical instrument or a portrait etc. But a Tiger...hmmm...erring on colour. A deer in autumn foliage, the yellow eyes of an owl, the vibrant feathers of a male mallard duck; all of these things and more benefit from the use of colour in my pyrographic work. 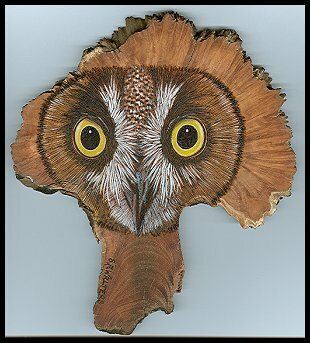 INTERSTING FACT Did you know, in my recent poll (about what form of pyrography people would most like to see/learn) that 'colour pyrography on wood' got one more vote than 'monochrome pyrography on wood'? (136 colour, 135 monochrome.) Who would have thunk it hey? It does show, regardless on your point of view, that a lot of burners are keen to use and see colour. Sometimes though, my use of colour is dictated by what I'm burning on. For greater contrast pyrographers will often choose a light toned wood to burn on. Sometimes though, you either can't find enough good wood or you want to try your hand at burning on figured or dark wood. I decided to have a go at mallee wood, which is a heavily figured and extremely hard Australian wood. The only way I felt this timber could be used for my work was to approach it almost like the wildlife carvers do. They use a burner as a texturing tool for fur and feather and then often seal and paint over the top of the texture. I decided to burn the texture of the animal into the surface and then apply paint in a way that allowed selected burning through....sometimes a hint, sometimes all of it. In the next Pyro News we'll look at this subject more closely by following the making of a large pyrographic piece on mallee. I'll have a bit of a natter about the process and thoughts behind it. Wildlife patterns for pyrography - BIRDS, is the first in a series of patterns books and CDs directed specifically for pyrographic use. Designs for woodburners are pretty thin on the ground and we are often forced to use simple line patterns intended for relief carvers. They in themselves are nice but it's awfully difficult to know how to fill in the gaps...how to burn a realistic picture. Hopefully this series of patterns will help fill the need. Each book and CD will be theme based and soon to follow are: North American Animals, Australian Animals, African Animals and Exotic Animals. The book has 35 full sized pages . spiral bound to lay flat for easy copy . Protective cover . 10 line patterns, 10 tonal patterns . 8 pages of Key Element burning advice . 5 pages of pyrographic information The CD is in the form of an electronic book and has all the information the book has. It also has both low and high resolution files to print. Low resolution are for slow computers, high resolution will give you a super sharp print out. The advantage of a CD is you can print the pictures as many times as you want, in any size. You can visit this short web presentation to view the book or CD in more detail. If you would like to buy a Bird Pattern book or CD, you can visit the PATTERNS PAGE on my site. PATTERN COPYRIGHT CLARIFICATION Many poeple get a little confused about the copyright situation when they buy a pattern book. They see that there is a copyright on the cover of the book so wonder what they are entitled to. You should check the wording of each book to understand it's specific limitations but for mine you can craft apply my designs to art or products that you make for gifts, personal use or for sale. They can Not be used for the mass production of items, IE, stamping them on hundreds of pencil boxes or using the designs in manufacturing or corporate motifs etc. You can't give away or sell the actual designs themselves either. It does mean you can happily burn the designs on products for sale at a craft show or other outlets for your craft business. I got an email from a woman the other week asking for advice about what to do to prevent her pyrography from fading. She's certainly not the first person to be horribly disappointed by this problem. I myself have been shocked by the amount of fading on a portrait I did of my brother, and I'd like a dollar for each time this subject has come up in one group discussion or another. To my mind, this is one of the largest hurdles that pyrography faces in being more seriously accepted as an art form. It's a problem that I have tried to tackle at various stages in the past by conducting tests and a few of us even tried contacting some specialists to see if some answers could be found, all without success. I confess I haven't been a tenacious in trying to find a solution as I would have liked because, frankly, I get frustrated and sick to death of the blasted subject. Maybe there isn't a solution...maybe it's something we have to put up with. But as I answered this lady with the usual advice, I got to thinking about that portrait of Scott (my late brother). Why did that one fade and other work not? It is, after all, living in a very subdued light so that rules out the direct light theory. Yes, it is burnt rather shallow, so perhaps that is the answer. Yes, it is finished with oil and I have often suspected certain oil might hasten the process...or does it? Why do some very old examples of burning still look good if fade is an issue? 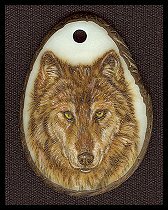 What we burners do suspect is that pyrography put in direct light (artificial and natural) with cause it to fade in varying degrees. Does flourescent light cause more damage than incandescent? We suspect this stops after a certain deteriation. Is this so? We suspect that gentle, light burning will fade faster than heavy, but what kind of light burning? Shader or skew? We hope that certain finishes will protect our work better than others, but is this so? Are certain woods better to burn on than others in regards to this? 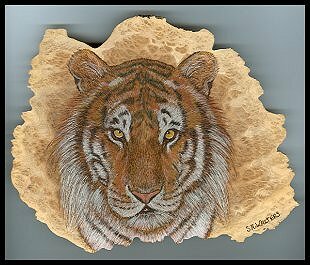 The jury is still out on whether fading in pyrography can be stopped but there is no reason we can't try and find out what elements best promote fading so we will be more equipped at preventing or lessening it. I considered doing another 'bullet poll' for this but I think the answers will be too complex for so few choices. I've decided instead to ask those who want to participate to cut and paste the series of questions below into the Email address provided (also below) and fill in the answers under the appropriate question. Do you have a pyro picture that you have noticed has faded? How long ago was it burnt? On what wood? Etc etc. PLEASE PARTICIPATE. YOUR ANSWERS WILL HELP ALL BURNERS! We have well over 1,000 pyrographers as members of the pyro newsletter and even if a quarter answer we'll be bound to get a nice cross section of the problem. I'll then compile the answers in a table and write a summary for a future Pyro Newsletter. I'll also publish all of this on my web site so all pyrographers can freely read the findings. If you have more than one faded piece I really hope you tell me about each one. The more evidence I get, the more we will learn. I will ask you to send ONE EMAIL PER FADED PIECE so that I don't have trouble separating the various answers. I will also ask you to submit information about monochrome (burnt) pieces only. Colour may mask the problem and also open up big batch of unknown variables. As you will see, these questions aren't multiple choice because there are too many possibilities. Please answer each section as briefly as you can...one word answers are accepted If you don't know what a particular wood is, describe it as best you can. If you don't know what a wood sealer/finish is made of, mention the product name. I'd also really appreciate answers in another colour if possible but if you don't know how to do this, black is fine....perhaps answer in UPPER CASE to help me out. Please copy the questions below and paste them into the PYROGRAPHY SURVEY EMAIL ADDRESS. Open the email by clicking the link above. Highlight the questions by left clicking and dragging your mouse over the text. Right click in the body of the Email and choose 'paste'. The questions should appear in the Email. Click below each question and insert your answers there. Type PYRO SURVEY in the subject line. When you have finished answering, click send to mail them to me. 1) How old is the piece? 3) What is the structure of the wood? (IE: solid (plank, natural round), ply, veneer, 3D (like a gourd or vase) etc. 5) What parts have faded? (IE: Have the lighter/softer parts faded more or the dark parts...or both? 7) Is it kept outdoors? 8) Is it kept inside where there is incandescent light? 9) Is it kept inside where there is flourescent light? 10) What is the piece sealed/protected with? VARNISH? (polyurethane, marine varnish, water based acrylic, spirit based acrylic, shellac, Deft, Krylon etc.) GLOSS, SATIN OR MAT? WAS IS SPRAYED ON OR BRUSHED ON? DID IT HAVE A U.V. FILTER IN IT? THE PYRO NEWS DATA BASE HAS MOVED. Unfortunately, a couple of emails found themselves posted to the Pyro News data base by mistake. Even though there was no harm in this, it is embarrassing to me and after much tweaking I have come to the conclusion that the mail delivery site I use is not secure enough for me to ensure this will not happen again. I did play with the idea of using Yahoo for the list but don't want to force people into joining a group if it can be helped. I've also looked at several other options for bulk delivery, without joy. For now I will hand deliver The Pyro Newsletter from my own mail server. With nearly 1,100 subscribers, (and growing each day) delivery wont be nearly as easy for me but I feel more comfortable in knowing no Email, except new edition announcements, can go to the list. If anyone out there knows of a good bulk mail site I'd appreciate if you could pass it on to me. At last a bit of new art work has been placed in the Tagua Gallery and the Wood Gallery. I always run out of time to scan and post work before it's sold but hopefully I'll be able to show more if I can get my act together. The wood gallery has some examples of colour work on mallee wood. They are all pieces produced quickly for fast turn over with most taking around one hour. 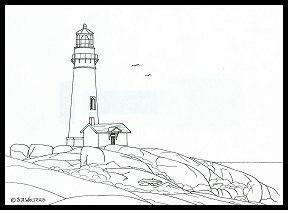 *A FREE PATTERN called 'Lighthouse on Rocks' is ready for downloading on the PATTERNS PAGE. *Lighthouse on Rocks is available as a pyrographic tutorial in the May 2004 edition of The Australian Woodworker, sold by newsagents and subscription throughout Australia and New Zealand. I now a lot of people have been waiting for the online lessons and once again I have to appolagise for the delay. I have been having some ups and downs with my server and have been nervous about starting online lessons with the chance I would have to pack up the site and move, or have the site just drop out. I'm still debating this but will make a decision one way or the other in the next 4 weeks. Once that is settled the first of the lessons will be offered. I will be first contacting the people who wrote to me specifically asking for lesson information and then will be openly offering any spaces left. TEACHING AUSTRALIA - I'll be resuming teaching in Australia soon. The public liability situation in Australia and my availability situation have been making this difficult for some time. The insurance situation looks like it's sorted out at last and I'm working on the availability issues right now. More on this soon. CANADA - The response to my teaching trip to Canada in September has seen just about all classes sold out. If you would like to attend you can have a look here to see if there are any available spots for a date that might be suitable. In the mean time I'm looking at my schedule to see if I can fit any more classes. If more dates are available, they will be posted on my teaching page at Chipping Away. SHOW APPEARANCES I'll be appearing at the following shows throughout the year. 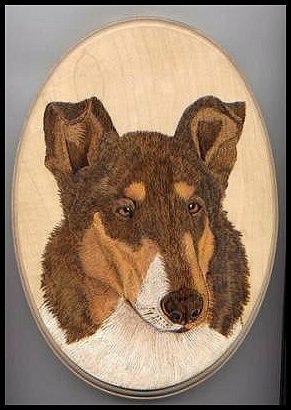 In Australia I'll be demonstrating and selling associated pyrography products as well as art work. In Canada I'll be demonstrating, selling art and doing a few seminars.